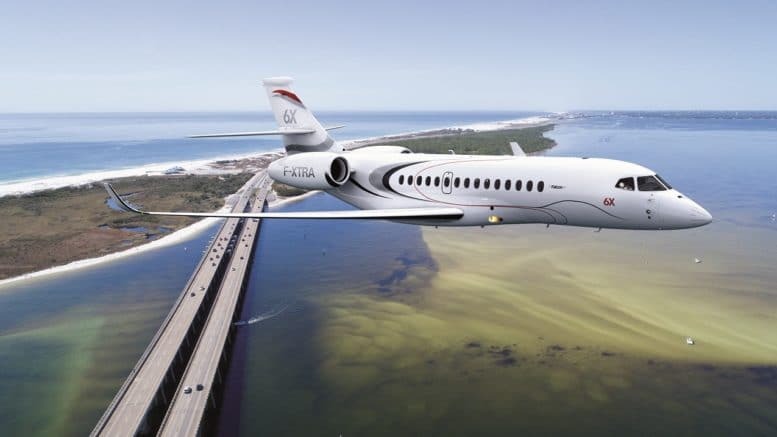 October 15, 2018 (Orlando, Florida) – Unveiled earlier this year, Dassault Aviation’s new 5,500 nm/10,186 km Falcon 6X ultra widebody twinjet has completed preliminary design and entered the detail design phase. “Everything is on track for the Falcon 6X to begin deliveries in 2022,” said Eric Trappier, Chairman and CEO of Dassault Aviation, at the annual NBAA Business Aviation Conference and Exhibition (NBAA-BACE). A full-scale mockup of the 6X’s spacious cabin will be on display on the Dassault static display (#2648) during the show.  A new onboard integrated maintenance system, FalconScan, capable of monitoring more than 100,000 parameters for real-time system self-diagnosis. Dassault’s revolutionary FalconEye Combined Vision System (CVS) — recently certified for approaches with 100 ft minimums on the Falcon 8X — will be included in a comprehensive options package offered with the first 6X aircraft. FalconEye is the first Head-Up Display (HUD) to blend synthetic, database-driven terrain imaging and actual thermal and low-light camera images into a single view, providing an unprecedented level of situational awareness to flight crews in challenging weather conditions and in all phases of flight. The extra-wide cabin offers individual seating for 12-16 passengers in three separate lounge areas and a number of layout options, including a large entryway, a crew rest area, and a spacious rear lounge. The Falcon 6X’s extra-large windows (30 total) provide abundant natural light, with nearly 5,300 square inches of glass and the highest percentage of window area of any aircraft in its class. The 6X also features an industry-first skylight in the normally dim galley area. And, like the 8X, the Falcon 6X will feature the quietest business aircraft cabin in the sky. Be the first to comment on "Dassault Falcon 6X Into Detail Design Phase"